The Cell Culture and Molecular Biology Platform provides support for a number of procedures related to these two activity areas. The Cell Culture Laboratory allows the execution and support of cell culture under a range of conditions. Experience in applications includes, amongst others, the screening of therapeutic or toxicological / pathogenic activities of chemicals, materials and microorganisms. Molecular Biology Lab (MBL) provides support for the extraction, purification and quantification of nucleic acids as well as the expression and quantification of particular genes from biological samples. Also available are services using methodologies such as PCR and Real time-PCR for microorganism identification and typing methods. The Platform permits researchers to use up-to-date equipment and resources and expert support, without the need to create and sustain their own dedicated laboratories. In the CCL platform all the experiments involving cell lines are carried out from simple basic cell research up to multi-parameter, cellular analysis evaluation with applications in many different research areas. 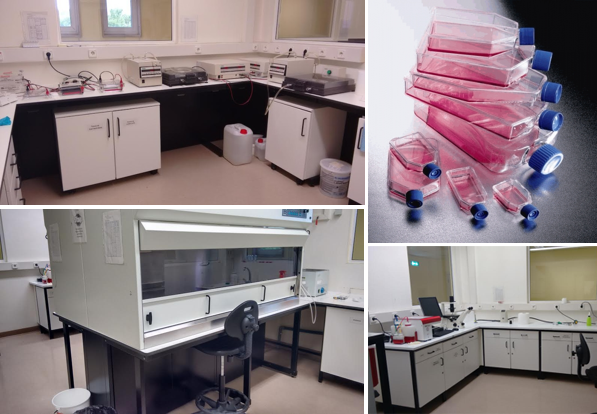 Equipment in CCL includes: two biohazard laminar flow chambers, two CO2 incubators, an inverted light microscope, a centrifuge, two cryopreservation tanks, two water baths and BD Accuri C6 analyzer with a workstation for data analysis. Equipment in MBL includes: one PCR (BioRad- T100 Thermal cycler) and one Real-Time PCR equipment (BioRad – CFX deep Well) an image acquisition equipment ( BioRad - GelDocXR+ with image Lab software), PFGE equipment (BioRad - CHEF-DR® III Variable Angle System) and Horizontal and Vertical Electrophoresis Tanks (BioRad - Mini-Sub Cell GT Systems and Wide-Sub Cell GT Systems) for DNA and protein analysis.